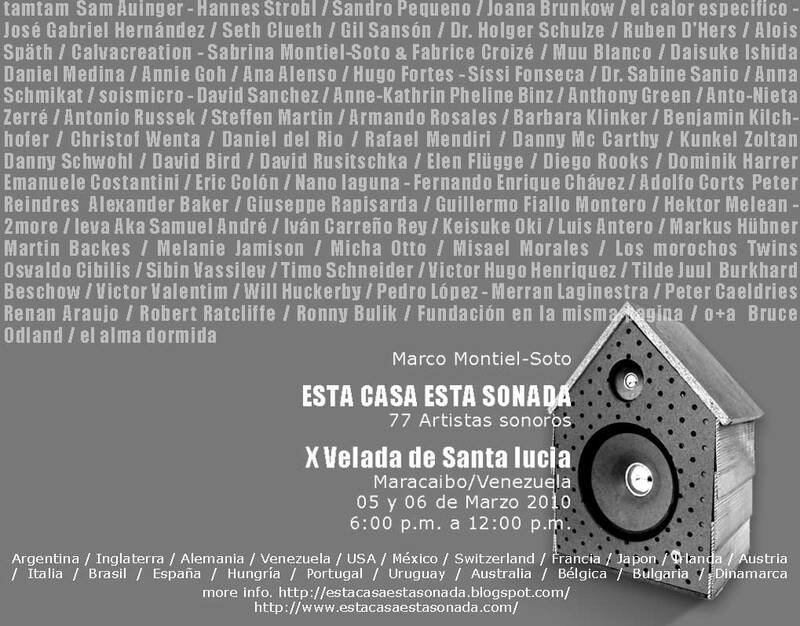 March 5 through March 6 the Esta casa está sonada (This house is a sound experience) sound art event takes place in a house in el barrio de Santa Lucia, Maracaibo, Venezuela (UTC -4:30 hours). The event is part of the annual Veleda Santa Lucia art festival. During the festival residents of the Santa Lucia neighborhood make their house available for the exhibition. The event features my ‘ResonantAtrium’ sound piece on day two, 11PM local time. From December 21, 1983 though January 18, 1984 Alvin Lucier exhibited his ‘Seesaw’ sound installation in the Film and Video Room of the Whitney Museum of American Art in New York. The installation aimed at having the visitor experience sound waves as a physical presence. In a small Max/MSP project I set out to recreate the experience. The idea is to have two sine waves generated in a quiet room, one at a fixed frequency of 256Hz, the other sweeping between 255.8 and 256.2 Hz. A spinning is noticed that accelerates to once every 5 seconds as the sweeping oscillator frequency drops from the reference 256 to 255.8 cycles per second. Movement is from the speaker with the highest frequency to the one with the lower. As the sweeping oscillator raises its frequency the sweeping reverses. For full experience the room must be free of reverb. For now my patch requires manual operation of the sweeping oscillator. 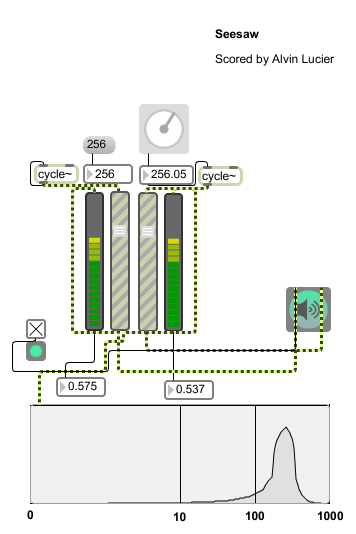 In the original installation the sweep down 0.2 cycles, up 0.4 cycles past unison and down to unison again would take 3 minutes. Automating this will be for version 2 of the patch. The spectroscope window provides on screen visual feedback about the (slow) beats occurring. Sleppet – The Sound of Norwegian Spring opened yesterday in Oslo. It is a commemorative sound art exhibition part of the 100th anniversary of Edvard Griegs death in September 1907 curated by Jørgen Larsson. It runs also as part of the Ultima Oslo Contemporary Music Festival. Quite a diverse collection of sound works brought together but all of it based on field recordings held in Norway during Spring this year. Artists are Natasha Barrett, Marc Behrens, Steve Roden, Bjarne Kvinnsland, Chris Watson and Jana Winderen. The Sonda Project which took place in Autumn 2005 at the Centre de Cultura Contemporània de Barcelona is still online. The project was part of the Zeppelin Festival de Proyectos Sonoros.